Rock and roll has always been about volume. For young people, half the fun has always been having parents scream, "Turn that (stuff) down." One of the early Rolling Stones records included the inscription, "This record should be played loud." And louder is naturally better--we're Americans; we always want more. As Oasis' Noel Gallagher once defined rock, "I don't think you can be too catchy. As long as you have your Marshall amps on 10 and it makes people's eyes water." Which is why the running joke in Spinal Tap, where the amps aren't the ordinary ones that go from 0 to 10--theirs go to 11--is perfect. And that's how you know the Grateful Dead were truly the weirdest of the weird--because by 1974 they had created the finest sound system in the world, pouring hundreds of thousands of dollars into it when they were making salaries of around $125 a week, sacrificing and scrimping to have the best--so that it would be so good that you only had to turn it up to, like, 2. And at 2 it could take your face off at 100 yards. Their pursuit of the sonic grail began with Owsley "Bear" Stanley way back in 1966. A short time before he joined the band as sound mixer, psychedelic source, and general grand poo-bah, he'd bought what was then called a hi-fi. He lived in a large space and thought big, and this home hi-fi had giant Voice of the Theatre speakers; it became the Dead's p.a. Bear also found a serious engineer and psychedelic true believer named Tim Scully to help him. Their ambitions were perhaps a little ahead of their abilities. JG: "...Owsley's idea was to build a sound system that produced real good clear loud sound with no distortion or anything like that--"
JG: "--just as loud as you could possibly imagine,"
JG: "Now the thing was that there was so much paraphernalia we needed in order to make a prototype that we spent five hours setting up and five hours breaking down every time we played..."
? : "And we hated it." JG: "And our hands were breaking, and we were getting miserable and unhappy and the stuff never worked..."
Later in the year they traded in the experiment for some basic Fender stuff and went off to work. But the seed had been planted, and from then into 1973, every cent they could spare--and all the time and energy they could manage--went into making the sound system better. They worked on many levels. For instance, instead of simply throwing up a system and hoping for the best, their main sound guy, Dan Healy, plotted room acoustics and developed architectural drawings of their venues, information he'd share with the halls they were using. Some of them even paid attention! By 1973, they'd added, among many others, an Ampex engineer named Ron Wickersham to their team. They'd also made a philosophical decision: Instead of simply adding more power (and thus more distortion) to their system, they made it more complex, making it multichannel with more cabinets out of the sides of the stage. Each box had only one or two speakers; it was extremely flexible, but all hand-assembled and logistically tough. It got tougher. An accounting from Wickersham in May of that year listed seven different projects underway--a condenser microphone, a pre-amp for dynamic microphones, a new monitor mixer, a new guitar system for the bass, a new p.a. array... "The sound system is a four-way system with crossovers at 350, 1000, and 4000 Hertz. Direct radiator speakers (cone type) in every range possible in preference to horns, which have a characteristic sound at high levels, a sound we don't like." It took four hours to set up, and it was indeed loud--they'd measured it on stage hitting 127 decibels. A Navy jet taking off from an aircraft carrier hits 130 dB at 50 feet. In November 1973, they had a planning meeting for some upcoming theatre gigs in Boston, and realized that the stage wasn't wide enough for their normal setup. The only way to accommodate what had become a not-so-small mountain of equipment was to put it behind the band... in a wall. By the legendary "sound test" of March 1974, they'd added a modular center speaker cluster and the Wall, although it was never a finished project, assumed what would be it quintessential form. And the form was simply incredible. You can see the pictures here, but it's hard to appreciate what it felt like to encounter it in 3-D. I only saw it once, at Springfield (Mass.) Civic Center, a relatively small arena. We came in through the lobby in the rear, and when we entered the main room and saw the Wall, we were frozen in our tracks. It ran not only the width of the stage, but towered some 40 to 50 feet above it. It looked like a giant alchemical sculpture, a modern day, high-tech, souped up version of an Egyptian pyramid. It exuded power. it looked as though you could run the world from it, or--despite its massive shape--it could fly. In its largest incarnation, it had 641 speakers--88 JBL 15", 174 JBL 12", 288 JBL 5", 54 Elecro-Voice tweeters--which required 26,400 watts of power coming from 55 600 watt McIntosh 2300 power amps. There were nine separate sound channels: vocals, Bob, Jerry, Keith, and Bill's bass drum each had one; Phil had two channels, with a possibility of four; and the rest of the drums (remember, in 1974 there was only one drummer) had two. All of this was brought together by a differential summing amp, reported the Alembic guys, "that aids in preserving the phase purity and hence the transparency of the sound." The sound then went to that aforementioned four-way crossover network, split four ways, and eventually to the speakers and out to the hall, where there was "quite an acceptable sound at a quarter of a mile without wind and an extremely fine sound up to five to six hundred feet, where it begins to be injured by wind." There were no monitors--after all, the sound was behind the band. And there was virtually no distortion--as I said, those speakers were working at 1 or 2, not 11. The band mixed itself. It was, said Phil Lesh, "like piloting a flying saucer. Or riding your own soundwave." And as folks gazed up at it in awe, Bob Weir, always ready to offer an alternative, commented, "Yeah, and to think we once had to cancel a gig because we couldn't find an extension cord." You'll hear in this CD how it affected the music. The stunning clarity of the system allowed the band to go places they'd only dreamed of, and its potential was truly remarkable, even though there were complications--it was simply too loud on stage. The theory had been that the music would go over their heads, but instead, said Lesh, the top layers acted as a ceiling. "It felt like I was underwater with pressure most of the time." And the positives very quickly became outweighed by the costs, both financial and human. As Garcia said, "What we had in the big p.a. was a physical model of the size of the sound we were trying create... the lowest note on a bass is 32 feet tall... and it worked... [but is was] the wrong direction for what the world is involved in right now... You can't use that much power... brute-force information out." Coincidentally, America was going through one of its periodic oil shortages in 1973-74, sending energy prices through the roof. The Wall required three trucks and too much of everything. In Owsley's words, it was "such a monster. It required so many people, so much bureaucracy... [it was] inefficient." 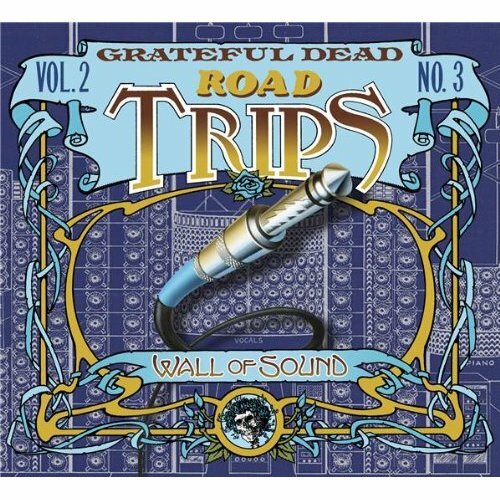 A mailer to the Dead Heads around that time noted that the traveling party included six for the band, four for lights, seven for staging and trucking, ten for sound, and three for road management. The sound system took a 40-foot semi, staging and scaffolding took two flatbed trucks, and the lights trundled behind in a 24-foot van. All of this weighed about 75 tons. And the expansion of the crew led to a certain loss of intimacy. The length of time it took them to set up the staging and then the Wall demanded massive energy, which led to lots of standard rock and roll drug abuse and crankiness. The only solution, eventually, was to shut down touring completely for more than a year--the only time in the band's history they stopped. They'd learned a lot, and in the 1980s they did the same thing with Ultra Sound and John Meyer to create what was a smaller and less visually imposing, but even better and far more efficient sound system. A high-end audio journal once wrote of the Meyer system, "The other night I experienced the finest large-scale High End audio system I have ever heard. It shattered my preconceived notions of what the state-of-the-art in High End sound reproduction is capable of." But I doubt anyone ever gasped, awestruck, at the sheer sight of it. This album was released in July 2009.